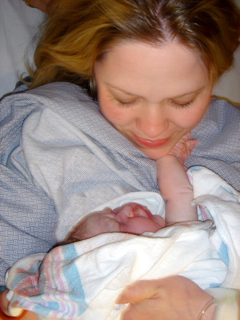 6 years ago today I packed up my bags to go the the hospital – was induced and started labor. Funny, I went to the hospital and did not think I would come back with a baby. I even planned going to coffee with 2 friends the very next day. How weird I was! It was my first labor, and was not a thing like I anticipated. There I was, expecting a text book labor or better… Expecting my body to progress like it should because I had no fear or anxiety about what was about to happen. Oh silly me. It was far worse that I could have possibly imagined,… shockingly worse, but the reward was far greater than I had ever dreamed. I was stronger and weaker than I thought possible. And when it was all over I joined a new posse: I became a mom. I’ve been sitting here wondering what I would tell myself 6 years ago, given the opportunity. But really… I don’t think I’d have listened. Let me just say I’d have shrugged my experienced self off and possibly rolled my eyes at the idea that labor would actually bring me *gasp* real extreme pain. I’d be polite and listen to my experienced advice but in my head I’d assure myself that things would be different. “Stop spreading your negativity” I might think, “I don’t receive that for myself.” And really, I believe experiences can be different, so that’s not to scare anyone who has not gone through labor, some people experience far better than they envisioned. I think I would tell my self 6 years ago to go with it. To be okay with whatever comes my way. And to, no matter how things go, not let such a precious moment make me feel like I in some way failed. So… it’s K’s birthday tomorrow and in a way I often feel like her birthday is a graduation for me. Tonight I complete 6 full years of being a mom and tomorrow I begin my seventh year. It’s gone by soooo fast. You know,… they tell you it will go fast, but it’s just so hard to imagine how fast it will go until you look at this child who is still a child, but really is too big to be carried around anymore, and you talk with her about life and answer real questions about relationships or seemingly grown up things, and it hits you: my baby is not a baby. She’s growing up. And while I’m still enjoying every moment of her sweet innocence and precious childhood, I am so happy I get to watch her and help her grow. I’m so happy I get to watch and help all 3 of my girls grow. So tonight, here’s to being a mom. Here’s to the diapers I’ve changed, the throw up I’ve cleaned, the hugs, the feverish and not so feverish cuddles, the messes, the band-aids, the trips to the doctor, the trips to the park, the songs I’ve heard sung, the laughter, the clothes I washed… and washed… and washed… the countless times I’ve tried to have a cup of hot coffee, the drives to school, the sobs that only my arms could soothe, the hours spent researching needs, the meals I’ve cooked & the little hands I’ve had help me, the tears I’ve wiped, the parties I’ve thrown, the spit up I’ve worn, the sounds of make believe that have never ceased to bring a smile to my face, the countless times I’ve had the opportunity to practice selflessness…. Best job I’ve ever had. Wouldn’t trade it for anything else in the world. Awe, what a beautiful reflective post on your entry into motherhood! It does go by so fast, doesn’t it? ahhhhh, I remember so well the precious (and challenging) moments of my babies …. and them growing into the wonderful, creative, intelligent, God-lovin’ adults and crazy good parents that they now are …. nothing more rewarding in all the world. happy graduation my daughter, you did great at her birth and ever since!!! i never thought of it as a graduation, but it is. i should be telling myself, good job, on every birthday of my kids. i think you are an amazing mom, by the way, and i should know because i see you in action. charis on A move and some bread. jeena smith on Mamasita it’s been awhile. charis on 7 years? Check.